Be the first to share your favorite memory, photo or story of Kit. This memorial page is dedicated for family, friends and future generations to celebrate the life of their loved one. 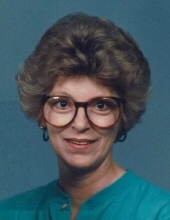 Kit S. Lahmann, age 72, of Sullivan, MO, passed away Friday, November 30, 2018 at her home surrounded by her family. Kit Simone was born on February 9, 1946 in Spring Bluff, Missouri, to Luther A. and Beatrice B. (Seaton) Guthrie. On October 9, 1965, Kit was united in marriage to Daniel Gregory Lahmann of Sullivan, Missouri, whom she recently celebrated 53 years of marriage with. To this marriage, one son was born, Brandon Guthrie Lahmann. Kit attended Cosmetology School and began her career as a Beautician by working for Harry Campbell. She later opened her own salon, “The Beauty Barn”, where she was self-employed for several years. Later, she was employed as a Pharmacy Technician at Strauser Drugs and then worked at Life Care Center & Mederi in Sullivan, MO. Kit enjoyed auctions, antiquing & collecting throughout her life. She liked to tinker and was a very creative landscaper & flower gardener. She was also an excellent poet & artist who enjoyed sharing her talent on projects with her granddaughters, Elle & Madde. Kit professed her faith in her Lord & Savior Jesus Christ at an early age and was a member of New Testament Baptist Church, where she at one time taught Sunday School and worked in the church office. She will be sorely missed by her family and many friends. Kit is survived by her husband, Daniel Lahmann of Sullivan; one son, Brandon Lahmann & wife Melinda of Bourbon; step-children, Debbie Lahmann & companion John Santanen of Summerville, IN, Greg Lahmann & wife Mae of Sullivan, Rick Lahmann & wife Karla of Sullivan; two granddaughters, Elleanor & Maddeline Simone Lahmann; three step-granddaughters, Patricia Kaiser & husband Craig, Jennifer Roam, and Jessica Lahmann; one sister, Brenda Setzler & husband Dave; three nephews, Greg Lawrence, Todd Lawrence & wife Janie, and Ben Lawrence & wife Kim; one niece, Staci Pfeuffer of Sullivan, MO; other relatives & many friends. Kit was preceded in death by her parents, Luther and Beatrice (Seaton) Guthrie; brother, Gregory Guthrie; sister, Judith Guthrie; step grandson, John Meade; and nephew, Donnie Teems. There will be a gathering of family and friends from 10:00 AM to 11:00 AM at Evergreen Baptist Church, followed by a graveside funeral service, which will be conducted at 11:00 AM, Tuesday, December 4, 2018 at Evergreen Cemetery, 8007 Hwy 185, Leslie Mo, with Pastor Chester Lahmann officiating. All arrangements were under the care of the Eaton Funeral Home of Sullivan, MO. To send flowers or a remembrance gift to the family of Kit S. Lahmann, please visit our Tribute Store. "Email Address" would like to share the life celebration of Kit S. Lahmann. Click on the "link" to go to share a favorite memory or leave a condolence message for the family.